Under Soviet forestry regulations, if a goat wandered into the walnut grove, standard practice was to shoot it. “Goats will eat anything,” says Hayat Tarikov, raising his arms into shooting posture. Tarikov used to work as a forest ranger in Arslanbob, at a time when the walnut forest was protected and its usage regulated under Soviet central planning. Now, he says, Kyrgyzstan’s government is not doing enough to ensure the survival of this unique bioregion. Arslanbob is home to the largest natural-growth walnut forest in the world. It’s a haven of biodiversity on the mountainous rim of the Ferghana Valley, a place where endangered animals and valuable forest products flourish. Tarikov is now the Arslanbob coordinator for Community Based Tourism, a network of sustainable tourism operators that organize homestays and horseback riding for visitors interested in village life. He still relies on the forest’s unique charm and scenic beauty for his livelihood, but is concerned about its future. The main threat to the 50,000-hectare forest comes from the unrestricted grazing of livestock. The animals’ grazing habits not only threaten new growth, but also increase the risk of tree-destroying landslides originating in the bare hills above the forest. The effects are clearly visible. Lines like topographic contours stamped by countless hooves ring the hillsides that buffer Arslanbob from its trademark towering backdrop, the 14,500-foot Babash-Ata peak. In places these trails have simply collapsed, revealing sheer gouges in the earth, exposing rocks and tree roots. The overgrazing of livestock is symptomatic of a deeper issue. Despite living in the midst of a world-renowned natural ecosystem, villagers invest in livestock because they feel that is their safest economic option. Arslanbob’s forest is not only exceptional for its walnuts, it also supports a variety of flora and fauna unique to the region. 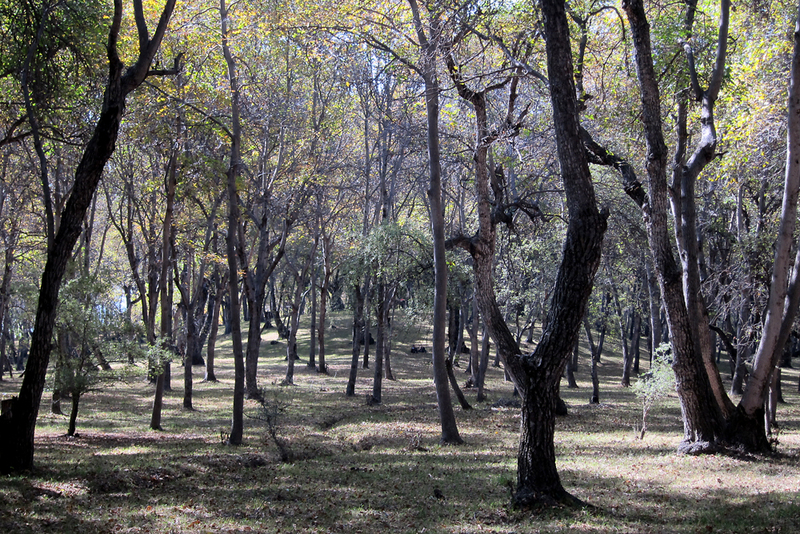 Forest ecosystems only account for about 4 percent of the land cover in Kyrgyzstan. Among them are fruit trees, whose fruit now tends to go unpicked. “The fruit is free! Mountain apples, cherries … but we need help,” says Marat Ashurov, a ranger for the National Forest Service who is responsible for over 4,000 hectares of the forest. Ashurov laments the loss of a factory that used to turn Arslanbob’s fruit into marketable puree and juice. The factory closed years ago, a victim of the region’s general economic instability and trade restrictions on the border with Uzbekistan down in the valley below. Without a reliable market for processed goods, no one has stepped in with the capital to reopen the processing plant. The economic breakdown has left locals to fend for themselves, encouraging actions that threaten the future of what is their most marketable asset. Even in a place like Arslanbob, with its array of natural resources readily available, there is simply, according to Tarikov, “nothing to invest in. So people take their money and invest in livestock.” Tarikov points to a cow, stationed in a cramped corner of his yard: “Livestock – it is our bank." October is the month when many families in Arslanbob leave their homes to harvest private plots in the forest. The whole family is involved: One person climbs a tree and shakes its branches while others scramble below to collect the falling nuts. This year the harvest is bad. It suffered from a hailstorm in the spring, which damaged buds and disrupted pollination. If Kyrgyzstan has a tourist trail, then Arslanbob’s forest is a firm fixture. But like nuts, tourists are not a reliable source of income. Numbers have dropped sharply since political and ethnic violence in the spring 2010. Michael Igoe is a freelance reporter specializing in environmental issues in Central Asia.